This Fall, September 2019, we are opening a nature preschool! 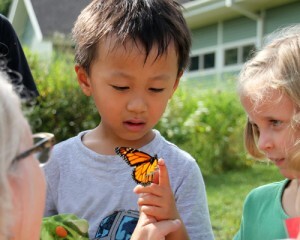 Aldo Leopold Nature Preschool is a program of ALNC and shares our mission to engage and educate, current and future generations, empowering them to respect, protect and enjoy the natural world. Aldo Leopold Nature Preschool will provide both indoor and outdoor environments rich in hands-on materials, literature and open-ended play time which encourage wonder, discovery, experimentation, invention, creation and the opportunity to see the results of one’s actions. Families will be notified of acceptance and tuition assistance the week of May 17. Please review our 2019-2020 Aldo Leopold Nature Preschool Parent Handbook prior to dropping your child off for their first day of nature preschool. Aldo Leopold Nature Preschool is planning to open in September 2019. Children must be three years of age by September 1st to attend. Please direct questions regarding the Aldo Leopold Nature Preschool to Nature Preschool Director, Tara Von Dollen. If you would like to be included on the nature preschool mailing list, please click here.